Our (internal) solution is based on the Unity video tutorial with Tips and Tricks https://unity3d.com/es/learn/tutorials/topics/tips/unity-tips-tricks-3 and heavily modified for MegAgeM needs. However the code shown from the video works 99% fine and is my recommendation for you, if you have to align a lot of GameObjects with the ground. We had this issue during the GlobalGameJam and I’m pretty sure that I was once able to do this directly in the editor. 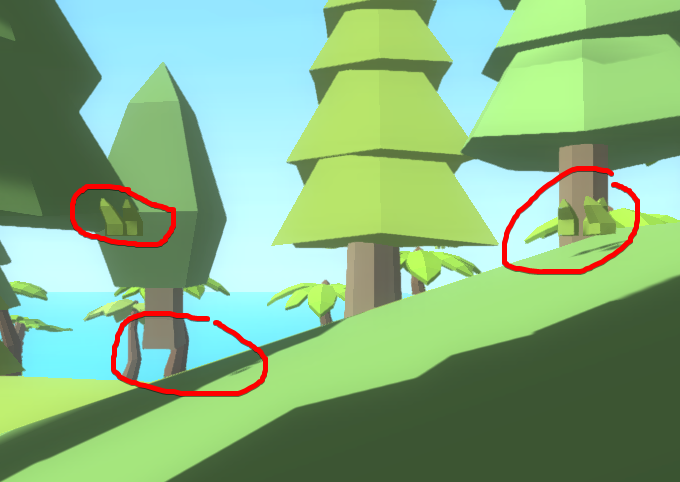 However I forgot the solution and have no glue anymore and so I decided to do a quick research on “how to place the flying GameObjects on the terrain or plane or ground” (See Screenshots to understand my problem here – some trees are just a few meters up the terrain). First I stumbled over an answer where someone recommends during runtime a “raycast” to what is the “ground” or “floor” in the scene. I also found this thread, where someone has created a JS script for usage in the Unity Editor to place the objects on the ground. I will test the code in the next days and add some updates on how this worked. // Did we find something? This is a free asset pack with a model grounder in it. It’s untested, but the name sounds promissing to provide a solution for the grounding of the trees. However… In the Scene View it is possible to navigate through the world with WASD if the right mouse button is pressed. This is how I fixed now some of the flying trees.